Bow hunting doves may seem impossible, but the sheer number of opportunities make it one of the best birds to try take on the wing. Doves are very fast flyers, and taking one down while pass shooting is very very difficult, but when you put the right plan together, you can shoot enough to feed a smallish human if they are not too hungry. 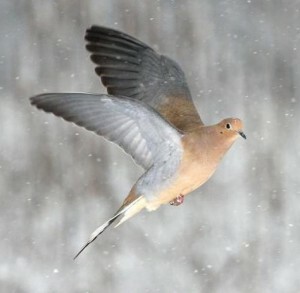 The key is to bow hunting doves is to shoot them as they back peddle to land. Two things happen as that dove reverses wing direction to land. The first is obvious – the slow waaayyyyy down. Common sense says a slower moving target is easier to hit, and common sense trumps. The second thing that happens is mentally they have committed to land. This commitment to landing means you now have an opportunity to SLOWLY come to full draw and shoot. They are still moving a little faster than you think, and it will take a while to get your lead right, but a dove committed to landing is the target you are looking for when bow hunting doves. The #1 tactic you will employ when bow hunting doves is spinning wing decoy. 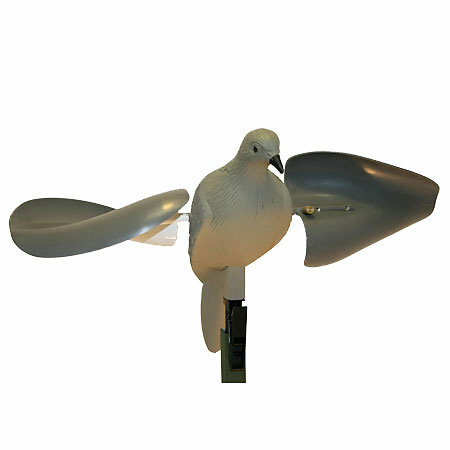 I like to use a couple stationary doves you pin on branches as well, but to get the doves in the perfect spot, nothing draws and positions them like a Mojo or similar motorized dove decoy. The second step is to play the wind. Doves like to land into the wind, just like any bird or airplane. Simple physics. They key is to find the best spot to set your dove decoy. Bow hunting doves in the evening means sitting near water. A water hole they visit just before dark is a great bet. The best waterholes have a ring of dirt around them with very little vegetation near the water. You need to set your decoy high enough for approaching birds to see it from a distance. A Small hill may do the trick, or you may use a piece of a dead tree to position the decoy. Approaching doves need to see the decoy from a distance to alter their course and play the wind if they are to land by your decoy. Tweak and refine your set when bow hunting doves until you have it perfect. As the evening progresses, do not be satisfied until you are set up for gimme shots. I am talking the birds coming straight at you, and back peddling to land 5 to 15 yards from your position. Keep tweaking until almost all the left and right factor is gone from your leads, and you are taking straight on shots at point blank range. Now you will start killing doves. Field sets for bow hunting doves can be trickier, but as long as you are shooting you are having fun. My best advice is to watch the field, and mark are spots the doves prefer to feed. This will put you where many of the birds want to land ,and that is a great start. Watch their direction of approach, and set up and tweak your set in that area like you do at the water. It’s best right away till mid morning, but you can hunts fields all day long. Just make sure you head for the water for the last couple hours for maximum success. Excecuting the shot when bow hunting doves is fairly simple. The shot is the most exiting part of bow hunting doves, and you will get lots of them. You are gonna shoot more in one night than 10 years of deer hunting, and when you mess up you try again a few minutes later. Joy by sheer quantity of arrows. The key is to maintain a low profile until the birds commit. Once they start to back peddle you can slowly rise and draw for the shot. I like to lie on my back with my bow on my belly, and do a sit up while drawing as soon as the birds commit. Keeps me low to the ground so the birds commit while quickly rising to an effective shooting position. Practice at home so your limb tips don’t hit the ground while bow hunting doves. You will be amazed at what the birds will let you do, may think me a liar until you get to full draw that first time, and the birds don’t react at all. Gear for bow hunting doves, like any traditional pursuit, is always simple. A spinning wing decoy, any camo duds (not crucial) A $50 reecurve, at least 3 Johnny Flu Flu’s, and some 6 inch Snaro bird points. The Snaro bird points give you an incredible margin for error, and easily disable the small doves with any contact. A Snaro bird point will never dive under the grass when you shoot, making lost arrows a thing of the past, and when those big wire hoops snipe your first aerial kill bow hunting doves, you will realize what an incredible wing shot you were bred to be, leaving you hooked on wing shooting doves with a bow forever. Bow hunting doves is something I look forward to every year, and bow hunting doves can be enjoyed by anyone.